I have spent a few dollars on hats and I have also spent a great deal more; yet the ones I have spent the most on, I have worn least and the ones I have spent the least on, I have worn most. NECESSARY: I have two hats in France. Neither cost more than 10 Euros and both are functional for sunny days when I forget to wear sunscreen. 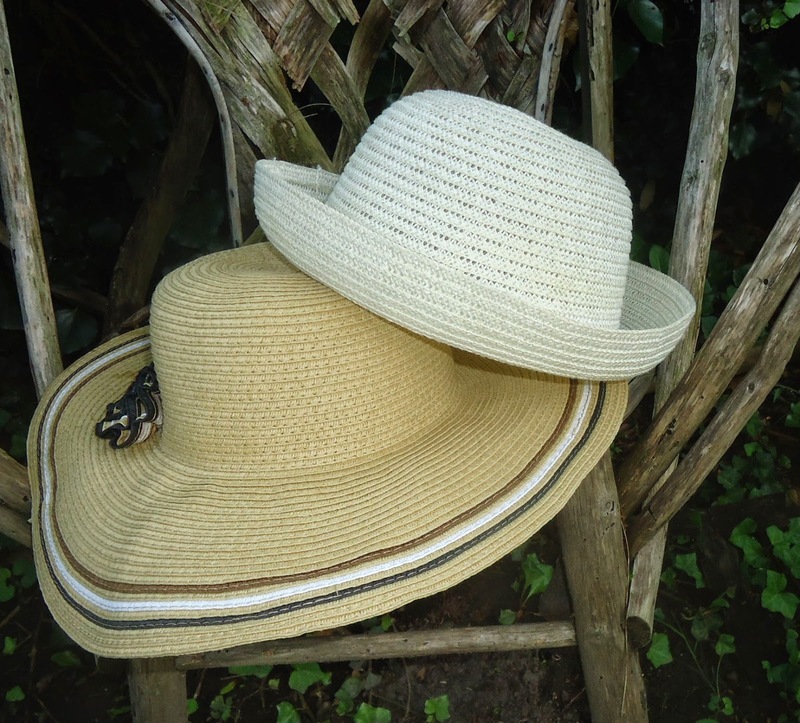 I purchased the white hat in 2010 in Bergerac and the wide-brimmed hat at the market in 2013 in Duras, Gironde, France. The wide brimmed hat was purchased on a very hot Monday in July out of necessity since we were going to be out for the whole day. One "hat" vendor had some beautiful Italian made hats starting at 40 Euro. I was not in the frame of mind to spend that amount on a hat that was to function as sunscreen and that I may never wear again. I'm glad I didn't. As I walked away, my husband lingered and the price for the next woman was 25 Euro. Needless to say, I was a tad annoyed and so there was no way I was going to buy from that particular vendor. I can't say that the shopper after me was younger or beautiful; but I can say that she was French and I'm a foreigner. My French language skills are not good enough to start a discussion about the vendor's tactics and then to try to continue to the barter stage. I found another vendor selling hats - very obviously the quality was poorer but at 10 Euros I was willing to give her the full asking price even though the hat was made in China and made of 100% paper. I know these hats and they can be purchased for anywhere from 75 cents to $1.50 (American dollars) but you have to do a wholesale order for at least 100. So no matter what this vendor paid for them, selling them for 10 Euros probably results in a better profit margin than the first vendor who was selling Italian made hats. Although that too is debatable. I read an article about a Chinese company named, you guessed it . . . "Made in Italy". Needless to say the Italians are livid and are attempting to stop this type of fraudulent marketing from happening. But I digress . . .
For the most part, I am spontaneous when it comes to buying hats, especially those summery "straw" hats. However, I have planned hat purchases, particularly for special occasions. NO THANKS: The last time I bought a hat for a special occasion was when I was invited to a winter wedding in France and that was in 2007. That hat is in a hatbox in Canada and has not seen the light of day since the wedding. Photograph provided by Melanie, Winnipeg, Manitoba, Canada, 2013. NICE: I don't know if this was a planned hat purchase but it certainly will serve the wearer well. 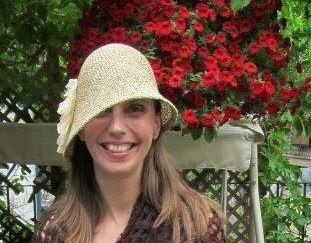 I am pleased to post this photo of my niece who purchased this lovely summer hat made by a Canadian designer out of Montreal at the Haberdashery in Winnipeg. NEED: I could use a hat like that . . . I am glad you were able to find me and that this post was helpful.